NEED SPECIALIST COMMERCIAL DRAINAGE ADVICE? At Owls Hall Environmental we have over 50 years experience with commercial drainage installations. We have extensive experience with commercial drainage systems and major attenuation and SUDs systems, as well as standard surface and foul water installations. We have been involved in a variety of projects around the country, with a particular specialism in large diameter and deep drainage. Whether you need standard drainage or a more complex system that uses modern technology, Owls Halls can guarantee an unparalleled service that provides the utmost care to every facet of your commercial drainage system. We are a dedicated civil engineering contractor and have a great understanding of new challenges in the sustainable collection and conveyance of storm/waste water in civil projects. Owls Hall will utilise a range of state-of-the-art technology so that every commercial drainage installation we carry out is run smoothly and with minimal environmental impact. 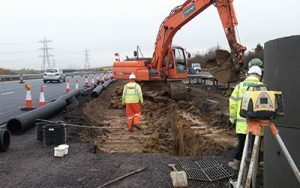 Our teams have experience and training in all types of drainage, from old to new works, and we always make sure to work with the procedures of highways and councils. We are available to work for a broad range of clients around the UK, such as local developers, local authorities, and both domestic and commercial clients. We have worked with a variety of commercial clients, including Balfour Beatty, Skanska, the MOD, UK Gov and others. Have a look at our recent case studies here.